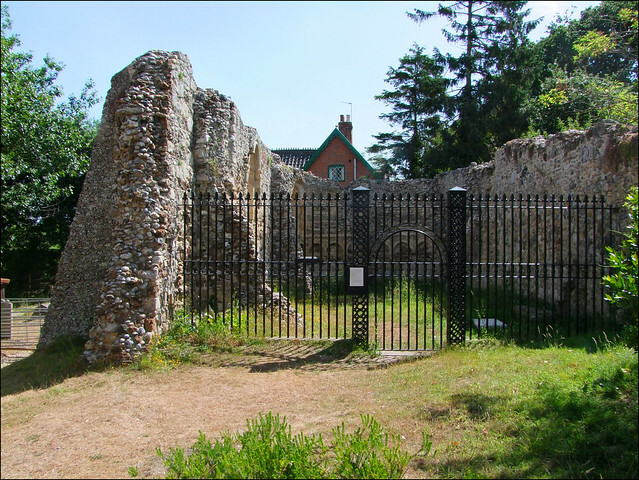 The ruin of the former chapel of medieval Dunwich's leper community sits in the graveyard of St James, although it would be more accurate to say that the church was built, in the 1830s, in the former grounds of the leper hospital, which had also been dedicated to St James. It was in 1175 that a decree was passed directing that lepers should be accomodated in hostels on the outskirts of towns and cared for by the Church, so that they did not mix with the rest of the population. The Norman arcading in the ruined chancel here suggests that it cannot have been long after this that Dunwich's hospital was erected. Today, it forms the Barne mausoleum, so you can't go inside, but the iron fencing conveniently marks the point at which the former chapel was separated from the hall and dormitory. The information board notes that the Hall was about 20 metres long and 8 metres wide. There were beds the length of the hall with an open view of the altar. No trace of the Hall survives today; the ruined buttress in the south-west corner of the graveyard which might confuse you was not from this structure at all, but was brought here from the now-lost church of All Saints, which went over the cliff in 1919. The Catholic Church's care for lepers in England did not survive the Reformation, and by Elizabethan times the care of the poor and sick became the responsibility of individual parishes. This chapel was last used in the late 17th Century, but had probably stopped being used for its original purpose long before this. That so much has survived here is because the hospital was set on the western outskirts of the town, away from the sea: but of course, the sea gets closer every year.